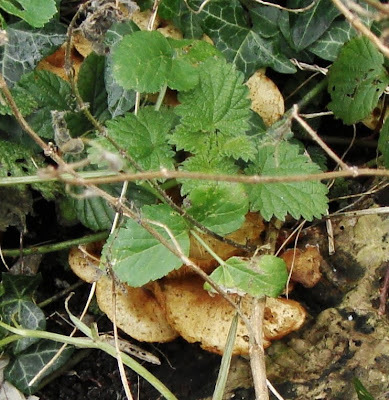 which were growing on a stump in an area which had, until shortly before, been lightly wooded. The trees had been dieing for a while (don't know what of) and whenever there was a wind there was the risk that yet another would fall across the path. They were beautiful in their demise - bark peeling away in great elephant-skin chunks so it was sad to see them go, even if felling was essential. 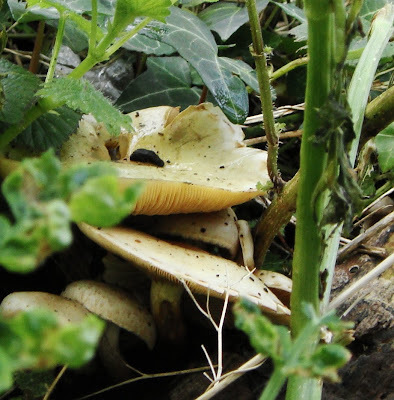 At the time, I wondered whether the same fungi would appear this year, given the change in their habitat. It didn't - and for a long time, I thought that was it and nothing would come in its place. For most of the autumn, it was warm and wet and everything kept growing greenly. On and on went the rain, week after week. 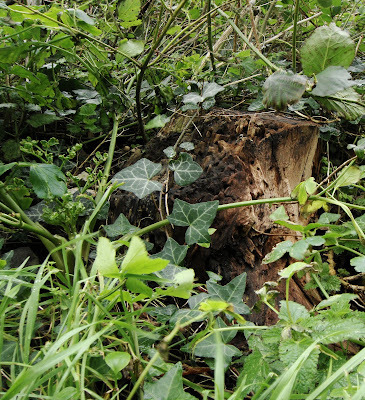 Ground elder and nettles kept growing, new ones springing up to replace those which had died back or been cut down. I edged them gently aside with my foot to see what was happening. (I don't willingly put my hand into low level vegetation where dogs go!). Nothing. And they weren't the only fungi missing this autumn. 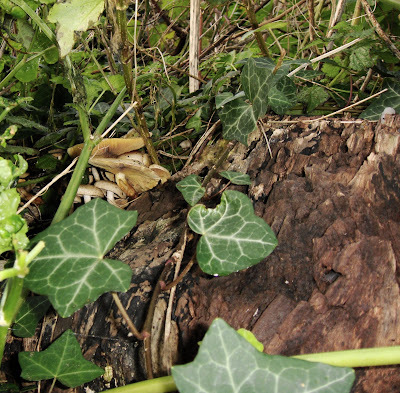 The ones with the rings of colour didn't return (see that same post) and the log which was home to pretty yellow toadstools (The New Linnaeus) has been taken from the ditch. Don't know where it's gone. Then, at the beginning of December (the 3rd) these - on the stump where the flute shaped ones had been. They were later in starting than the flutes, smaller and more conventionally shaped. They were also tucked inconveniently under the weeds. They grew. By the 9th December, they were like this. From a different angle, on the same day. January 5th - The ground elder is beginning to flop. It's easier to see them now. They are growing tatty and an orangey brown. And then . 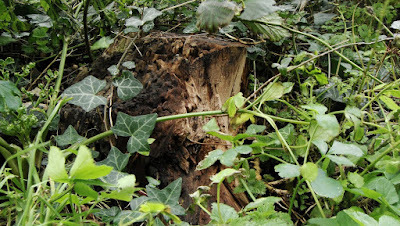 . . while preparing this post, I looked back through my files for or a picture showing the empty stump. As I said at the top, this photo was taken in November, when I thought there was nothing there . . . but . . . but . . . peering into it . . . what I hadn't noticed at the time, even when I was looking for them . . . there they are, little white blobs, shaded, half-hidden and out of focus. If only I hadn't been set on flutes! When it comes to making you see things -aren't photographs wonderful! Loved your pictures!!! I am glad you found some too! I'm not sure whether these are later because there's something different about the weather (lots and lots of rain!) or because they are of a different variety from the ones which grew here last year. It's interesting how I'm finding different fungi this year. More to come! 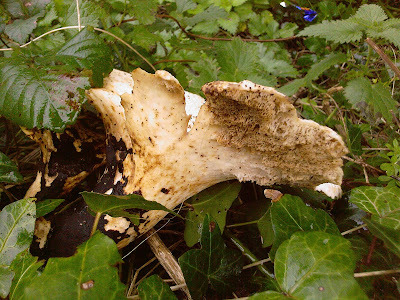 Fungus is like an old friend (or deadbeat relative)... it always comes back! :) You just don't know when. Enchanting pictues, as usual. It's so nice to be reminded that under all this snow, there is a gloriously varied undergrowth. Roll on the thaw, say I. The difficulty in taking photos here in the last couple of months hasn't so much been the snow but rain and very low light. 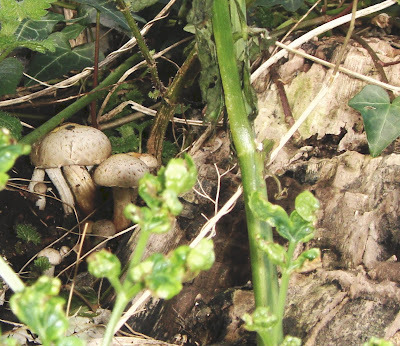 And the undergrowth has kept growing, making it even harder to see fungi like these. Sometimes I think this blog is more a testimony to the resilience of ground elder than to anything else. I've felt a bit self-conscious this year peering down at old bits of wood with nothing on them. Fortunately, the rain has kept people at bay from asking what I'm looking at when there isn't anything to see! Maybe the empty ones will be rich in fungi next year. Then I'll be the one stopping passers by and saying "Look! They're back!" Hi Lucy, what wonderful photos. 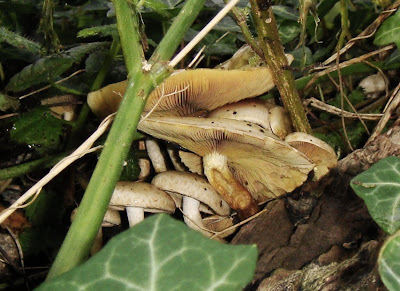 There is something magical about funghi, they are so different to other plants. We gardeners certainly spend much time peering at plants to see what has changed! Lovely photos, makes me crave spring.